An electric smoker uses low temperatures to slow-cook food and give it a smoky flavor. Most smokers contain a pan of water for moist heat, although you can also buy a dry smoker. Both types work for vegetables. Smokers are often used to slow-cook meat, but you can also cook vegetables in your electric smoker. The vegetables take much longer to cook using this method rather than cooking them on the stove top, but they will have a smoky flavor and crispness from the smoker. To reduce the amount of smokiness, wrap the vegetables in foil. Wash the vegetables. 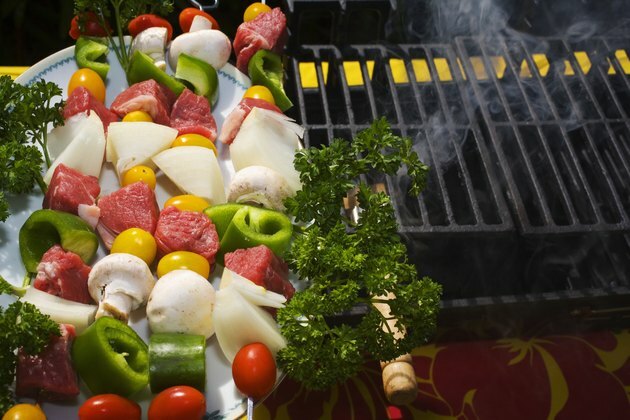 Cut larger vegetables like onions and tomatoes into smaller pieces so they cook faster in the electric smoker. Skewer small pieces so they don't fall through the grate in the smoker. Place your electric smoker on a flat surface, away from any flammable materials and in a low-wind area. Plug the cord of the smoker directly into the electrical outlet without an extension cord for the safest use. Add wood chips and water to the smoker. Follow the specific manufacturer instructions on the types of wood to use and how to fill the smoker. Allow the smoker to heat up in preparation for the vegetables. Place meat, if you're smoking it too, on the grill first. Proteins generally take longer to cook. Vegetables will likely take between four and five hours to fully cook, unless they are particularly large. Time the start of your meat based on how much longer it needs to cook than the vegetables. Place the vegetable chunks or skewers on the rack in the smoker. Close the smoker and allow the vegetables to cook for three to four hours. Test the vegetables to determine if they are fully cooked, and continue cooking until they're done. Remove the vegetables from the smoker when they are sufficiently cooked. Serve the smoked vegetables as desired. Unplug your electric smoker and allow it to cool fully before putting it away.